There are many industrial applications that involve slicing materials into smaller portions and replacing them on different rolls that are narrower than the original. The machine that is used to accomplish this is known as a slitter rewinder. Depending on the needs of your project, you may require either rewind slitting or log slitting. Rewind slitting runs the web of material through the slitting machine and rewinds it on at least one shaft to give you a roll of narrower materials. The rolls will pass through lasers of knives in order to be cut. In this case, the narrow strips are called “mults if the diameter is similar to the width or pancakes if the diameter is much more than the width. A rewind slitting machine may also be known as a slitter rewinder, a slitting machine or a slitter. If you have a need for a rewind slitting process, you may need a rewind onto a bobbin-wound reel. This is a more stable configuration that can handle long lengths of material on a single bobbin. Log slitting treats the original roll of material as a single entity. Slices of material (known as “the log”) are taken from that roll without the need for a re-reel or unrolling process. ZOi Films can perform either type of slitting. We have the hardware and the expertise to modify our process to meet best practices based on client needs. Soft materials such as paper, textiles, plastic films and textiles require a different type of methodology from hard materials. We use Razor blades or circular blades to cut the material depending on its individual needs. We can set your blades to a custom width and produce multiple output rolls at one time. We rewind your slit material on metal, paper or plastic cores as it exits the machine. This process is ideal for mass production at a low cost. Not only do we monitor the slitting blades and sharpen them in real time, we also control the tension of the material through an automated process that positions the cutting knives in their optimal position and aligns cores automatically for the best results. Use the soft slitting process for foil, plastics, tarps, fabrics, film, release liner, glass cloth, paper, foam, rubber and adhesive tape. Harder materials include sheet metal, and the blades that are used for soft materials cannot accomplish the cut here. Rather, we will used a modified shearing procedure that makes use of dual cylindrical rolls that have matching grooves and ribs. This production process is used to cut down a single roll into many smaller rolls that are much narrower. This process is continuous, highly economical and very precise. We also modify our procedures to ensure the least amount of burrs by creating a highly specific tolerance according to the workpiece thickness and material type. We can apply razor slitting, crush cut slitting or rotary shear slitting based on the materials and the needs of your project. Razor slitting is best for thin plastic. We make sure to change the cutting blades frequently to ensure the best quality slit edge. Rotary shear slitting uses two kinds of knives to create the effect of incredibly sharp scissors. We use this technique on foils, paper and films. Crush cut slitting uses an anvil and a male knife that is best used on foams and woven materials. From thick aluminum to the very thin gauge papers, ZOi Films can address any and all slitting needs. 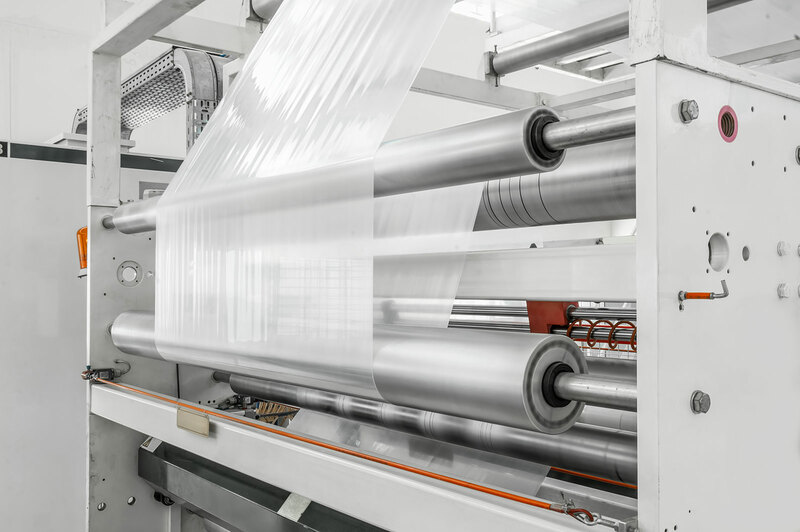 Our core competency is to slit and rewind plastic films, but we also process papers, nonwovens, fabric, scrim, rubber, vinyl, and metals, just to name a few. From very narrow (0.25” wide) to very wide (100” wide), we have the right equipment to address your requirements.